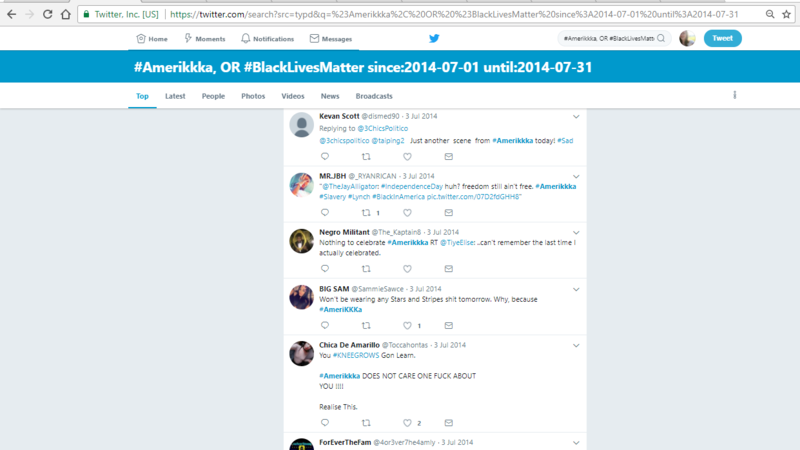 Through this final project for our Digital Humanities course, I want to investigate why #BlackLivesMatter became both the name of a movement and a word in the dictionary when other racially relevant hashtags have been influencing the same conversations possibly for longer amounts of time. 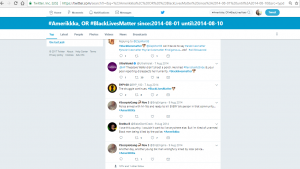 Using blessays, I intend to blend academic writing with the style of more informal blogging and hope to connect and compare #Amerikkka and #BlackLivesMatter via the lens of Twitter as a living archive. This lens will allow me to investigate how conversations that are created by hashtags can complicate our understanding of the archive. If an archive is essentially privileged information through which the researcher further picks, how do the ethics of interaction differ in digital and born-digital spaces? How can social justice initiatives on social media create a noticeable impact on tangible society? The discussion of impact will be confined to ideas that derive from born-digital content; thus, perhaps a better reframing of this research question is how can ongoing, informal conversations on Twitter affect society. The following pieces of writing will introduce readers to my experience in volunteering for an archive, definitive work for archive and living archive, the actual Twitter conversation analysis, and a conclusive statement. In the future, I hope to add to this project by continuing to compare Twitter conversations that pertain to social justice and learning more about the impact of social media activism. To further explain the chosen form for this project, interested readers may find this link useful: http://www.dancohen.org/2012/05/24/the-blessay/. Blessay is a term coined by Dan Cohen of which one of the most important characteristics is rule number two: “Informed by academic knowledge and analysis, but doesn’t rub your nose in it” (Cohen). Thus, in the following posts, I hope to convey an understanding of the scholarship without seeming pedantic, falsely enthused, or even overly analytical. According to Yoni Appelbaum, as seen in “Update 2” of Cohen’s article, “It’s not journalism. It’s not blogging. It’s practicing the art of the essay in the digital space.” Because of Twitter’s digital presence and the impending conversation about digital affordances, employing the digital essay—or, more creatively, the blessay—suits the topic and eases the incorporation of digital tools and direct links. Finally, moving texts from their assumed spaces to the digital realm is an idea that will flow between each post, as digitization is an ongoing conversation in DH studies. The desire to increase access to documents—whether the limitations of accessibility derive from language, location, authority-based, or other issues—is not new to the archives. A quick search for the Hemingway Collection at the John F. Kennedy Library in Boston, Massachusetts, for example, provides straightforward information about how to conduct research remotely via their digitized collections. A more specific model of this means of curating researchable information can be seen through the digitized collection of Hemingway photographs, which can be found here. Notably, this use of technology creates both positive and negative effects in regards to changing an artifact’s medium. Here, Walter Benjamin’s essay “The Work of Art in the Age of Mechanical Reproduction” comes to mind because, in essence, Benjamin’s work argues against the idea that any semblance of an aura is lost as an artifact is transferred from one medium to another because the reproduction is entirely different from the original and the aura is merely a social construct. Questioning whether this sense of provenance and privilege carry over into digital spaces is an idea I will return to later. Contrasting this oversimplified explanation of Benjamin’s idea, some archival researchers such as Malea Powell, for instance, emphasize the need to experience the physical archive—to experience the original—because seeing and feeling the artifacts in person inherently conveys a stronger sense of realness, a connection to the imagined aura. This feeling may simultaneously invoke a stronger desire to respect the archive. Powell discusses an archival experience in her article “Dreaming of Charles Eastman: Cultural Memory, Autobiography, and Geography in Indigenous Rhetorical Histories” in which a physical manifestation of the artifacts’ shared aura appears, causing the material to materialize. Charles Eastman, the man whose letters Powell held, “step[s] from a photograph on the table beside [her]” (Powell 120-121). Thus, the understanding of and reverence toward the collection’s ties to a real past necessitate physical interaction with the artifacts—at least in Powell’s instance. In turn, interactions with a digital archive are severed from the latter experience; digitized works are entirely new representations of something, irreverent to aura and original creation. Therefore, digitizing artifacts also dehumanizes them to a degree because of the lost connection to material reality in the new digital space. For example, stepping into the JFK Library and holding photos of Hemingway cannot equate to viewing these same photos online, and the reproduction creates this chasm. The loss of texture, smell, and possibly access to notes on the backs of photos or other artifacts represent instances of digitization’s limitations. Furthermore, another limitation for the researcher that occurs post-digitization is that not all pieces of a collection may be available online, which could occur for a myriad of reasons such as the library not having the necessary funds to completely digitize all of the artifacts, restrictions on the artifacts, or other institutional conflicts. While there are many examples demonstrating the negative aspects of digitization, however, digitization efforts carry many positive traits as well. In archival work, one specific affordance of digitization is this notion of increased access as technology helps eliminate existing barriers. 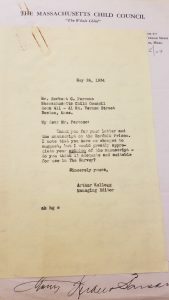 The American Prison Writing Archive (APWA) is currently working to digitize essays from prisoners so that there is less general confusion around the topic of mass incarceration and its effect on the incarcerated. More information can be found here. 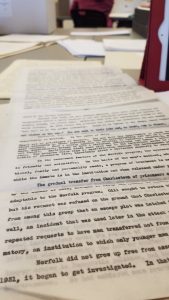 Because of its time-consuming nature and separation from the project’s ultimate goals, the digitization process allows volunteer transcribers to assist in reading and retyping submissions. Typing the prisoners’ essays permits search tools to work within the various essays’ contents, which could let someone search for a specific word across the database. It also removes any difficulty found in discerning a person’s unique handwriting. Thus, in order to help the project, volunteer transcribers need only two basic skills: reading and typing. Really, though, the reading portion is less important than typing since no interpretation or criticism needs to occur. This notion of labor without literacy is not new to the digitization conversation. Melissa Terras and Julianne Nyhan’s article “Father Busa’s Female Punch Card Operatives” addresses this dynamic in relation to the women who “via computational methods, [worked to produce] a concordance to c. 11 million words of Thomas Aquinas and related authors” (Terras and Nyhan). The project coordinator, Father Busa, “chose women who did not know Latin, because the quality of their work was higher than that of those who knew it (the latter felt more secure while typing the texts of Thomas Aquinas and, so, less careful)” (Terras and Nyhan). In this example and the APWA experience, labor proves more beneficial, while literacy may be a stumbling block to productivity. As someone who volunteers for the APWA, I know that not all of the submitted essays are easy to read and/or type, which in some cases is because the essays include drawings or were written in creative—maybe confusing—ways. One example of a creative format is an essay I viewed that was written in a spiral shape. In this instance, perhaps the original delivery must be maintained in order to convey the essay’s full ideas. Perhaps even the argument is buried in the form itself. This example is an instance where ethics and the archive’s goals may clash because what could be lost through digitization? What could readers be missing because of a standardized format? How can the tools accommodate individuality while still productively adding to the searchable database? By allowing anyone who applies to transcribe the essays, the APWA disperses the authority of their project, if only marginally. This dispersion obviously allows for a more collaborative, open approach to their academic endeavors. Could this inclusion harm the project? The APWA does not blindly accept the transcriptions from volunteers into their permanent archive, but instead skims over the transcriber’s work before officially accepting the digitized version. This screening ensures volunteers are respecting the chosen essay’s original content and delivery. Also, as mentioned before in relation to Father Busa’s project, expanding the project to include volunteer transcribers does not rely on the volunteer’s literacy, but rather their labor. So, through reviewing the transcribed document before adding it to the database, the APWA ensures volunteer labor is well-intended and accurate. In one essay I read for this online archive, the author used the word “Amerikkka.” Questioning whether he coined the term himself or was contributing to a larger conversation, I chose to enter the term into Google’s Ngram Viewer. Notably, while Ngram displays the word’s rise and fall in usage, it lacks any further information. Therefore, the graph shows the word’s rise in popularity between 1985 and 1996, which could be attributed to the release of Ice Cube’s album, “AmeriKKKa’s Most Wanted,” in 1990, but because Ngram only shows trends in popularity, this connection remains purely speculative. Following this search, my curiosity led me to Twitter. 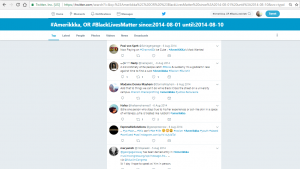 Using Twitter’s search tool, I found many tweets connected with “#Amerikkka.” This satirical spelling was neither created by the man who submitted an essay to the APWA nor confined to conversations about Ice Cube’s album. Instead, this term exists as a part of a larger, tenser conversation that can be accessed via Twitter. Before delving into how Twitter complicates conversations about the archive, let me explain my line of thinking and word choice. First, a Ted Talk by Grammar Girl (see below) addresses English as a living language. She describes the language as such because of its ability to constantly evolve and develop based on a system of voting. By using words in our daily conversations, we participate in this democracy of language and “vote” for the words (Fogarty). If we approach the term “living” from this mindset and redistribute it to modify archive instead of language, then the living archive’s space is also one that is not static. A living archive is never complete—or even a concrete thing. In this space, Twitter can be approached as a living archive because of the linked conversations that occur through hashtags. In these linked conversations, the artifacts that encompass the conversation—or archive—may be added, hidden, or entirely removed based on the user’s preference. In this sense, the accessible information ‘lives’ as the user alters or adds to the data. Thus, even in searching for a specific conversation in the past, the artifacts may fluctuate: disappearing and reappearing at the user’s discretion. This notion of living implies the existence of an exact opposite: a ‘dead’ archive. The binary opposition therefore assumes the inversion of what I define as a living archive is an archive that is static: consistent and unalterable. Although archives are obviously more complex than this description, I consider ‘dead’ archives to be those that cannot develop to the extent that Twitter hashtags can. 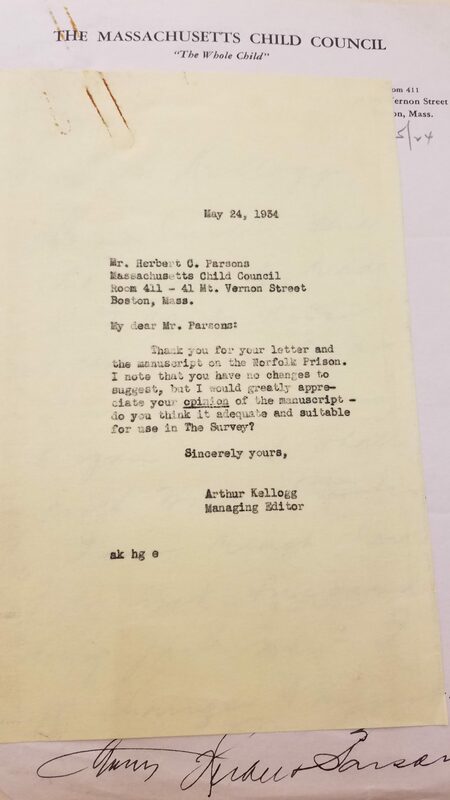 For example, returning to the Hemingway example from earlier, the JFK Library’s Hemingway Collection may grow based on the founding of new artifacts; however, I assume most of the contributors to this archive cannot actively engage in the corresponding conversations due to issues of access and/or their general states of being. The contributors lack agency and activity, which is not true for hashtags as their contributors literally create the content and place said content into this digital space intentionally. Even the APWA’s online archive, though also existing in a digital space, does not change or develop further in the ways hashtags can; the media aspect renders hashtags more capable of incorporating themes of collaboration and individual agency. While the exigence for tweets using the hashtags #Amerikkka and #BlackLivesMatter may be the deaths of specific people, the humans creating and developing these conversations actively contribute to this born-digital content. Returning to the idea of English as a living language and putting this idea in conversation with Twitter as a living archive, the first hashtag was accepted into the dictionary in 2014. 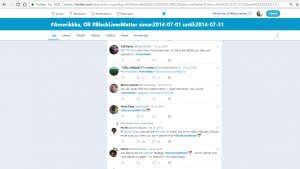 This hashtag, #BlackLivesMatter, was selected by the American Dialect Society as their word of the year, which demonstrates Twitter’s ability to act as more than simply a mode of entertainment. 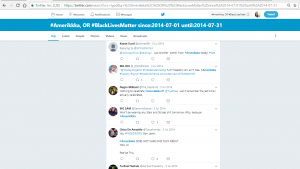 The American Dialect Society attributes #BLM’s rise in popularity to the conversations that occurred using it following the deaths of Eric Garner and Michael Brown. 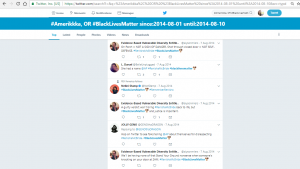 Notably, #Amerikkka was also used popularly alongside #BLM, but because of #BLM’s more positive and specific explanation of its focus and intentions, #BLM’s significance as a living archive, language-changing word, and means for activism deem it more relevant and impactful. 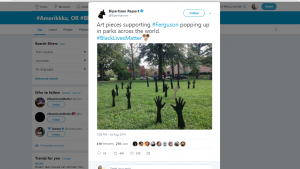 The use of #BLM as a key symbol for human rights in the United States plays with Rayvon Fouché’s scholarship about the intersection of race and technology. Fouché criticizes scholars who focus on “technology as material oppression…[as] the only way to consider African American technological experiences” (Fouché 640-641). Instead, he urges scholars to expand their approaches to consider the role of African American creativity. Forefronting a conversation from social media as a catabolic component to social activism exemplifies the interaction between African American creativity and technology. This relationship occurs because Twitter removes the mediation seen in other archival spaces and thus provides a way for disenfranchised voices to re-enfranchise themselves on their own terms. Additionally, the satiric misspelling of America in #Amerikkka speaks to the same vein of thought. Overall, Twitter hashtags provide a means for African Americans to productively use technology in a collaborative, impactful way—i.e. catalyzing an entire social movement. In the first blessay post, I mention Benjamin’s work with provenance and privilege in regards to reproduction. How does audience response change based on the space in which they encounter an artifact? Like the Powell discussion, experiencing the physical can evoke a stronger pathos appeal, but how does this response shift when looking at born-digital content? 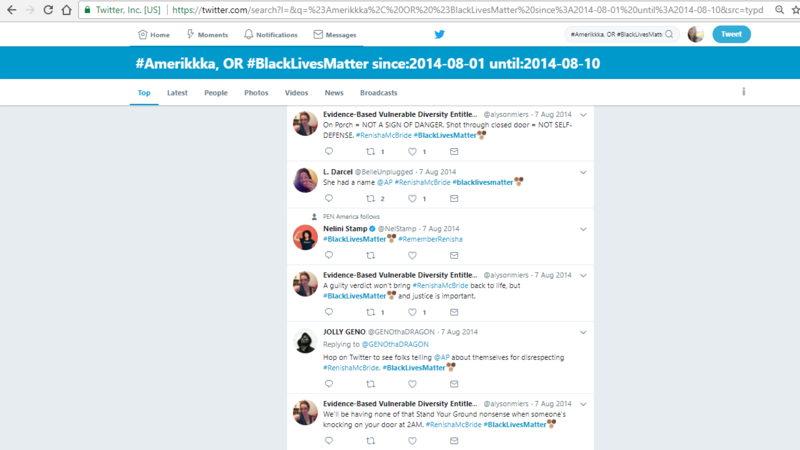 How do we react differently when happening across #BLM and #Amerikkka tweets on our Twitter timeline versus seeing the compiled conversations of these same hashtags? What about when seeing hand-picked tweets on a different digital platform such as this WordPress site? Changing the way in which a reader encounters artifacts inevitably affects reader reception. The digital space in which the artifacts—or tweets—are seen changes the impact thereof. 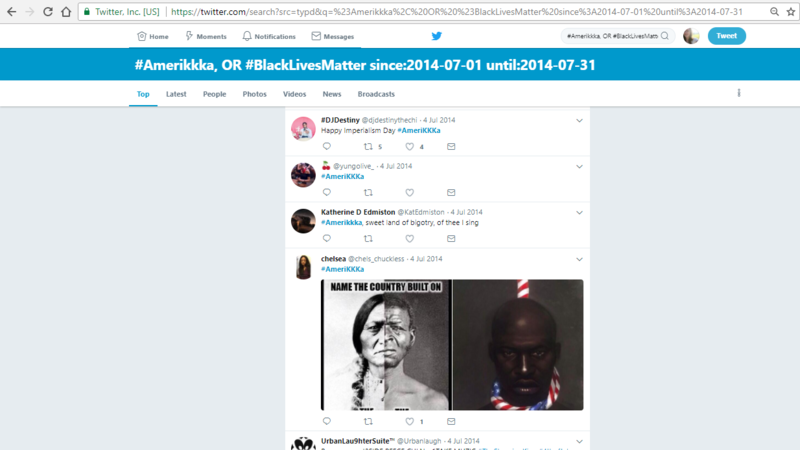 For example, a tweet containing #Amerikkka that may appear on a user’s timeline and is mixed-in with tweets about other current events may not be as attention-grabbing as viewing the hashtag’s archival conversation. When viewed in passing, one voiced concern carries significantly less weight than hundreds of voices. To reflect on an earlier idea, though, these born-digital artifacts remove issues of needing authority to voice concerns. Because they are ‘originals’ and thus if one believes in an aura, then the human relationship to the digital words cannot be severed. The only limiting factors for those who want to contribute to Twitter’s archives are literacy and access to the necessary technology. Eric Garner and Michael Brown are two African American men whose deaths sparked the #BlackLivesMatter movement in 2014. 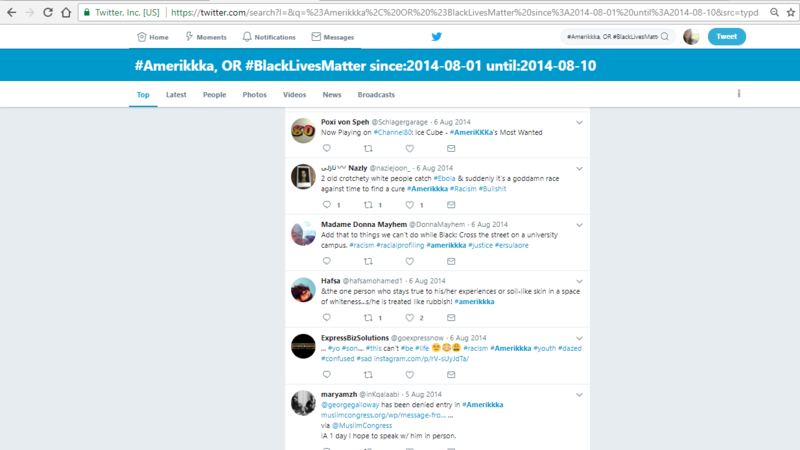 Using the Advanced Search option on Twitter, I pulled tweets that used #BlackLivesMatter and #Amerikkka between the dates 1 July 2014 to 31 July 2014 and from 1 August 2014 to 10 August 2014. I did this in an attempt to compare #Amerikkka to #BlackLivesMatter. More information about Eric Garner’s life and his altercation with the police from July 17th, 2014 can be read in this New York Times article. For more detailed information about the August 9th shooting of Michael Brown, please reference this New York Times article. 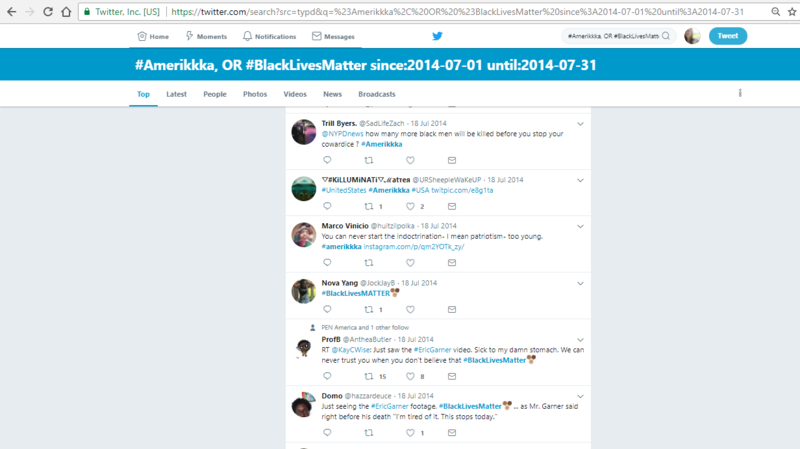 Although I occasionally use #BLM as an abbreviation in my own writing, it is important to distinguish here that the hashtag I searched was #BlackLivesMatter because #BLM is its own hashtag. 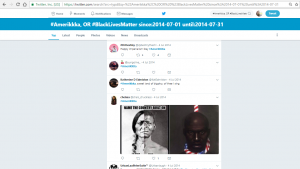 The first two images predominately show the tense conversation that surrounds #Amerikkka, while the third photo shows the beginning of tweets using either the two hashtags after Garner’s death. 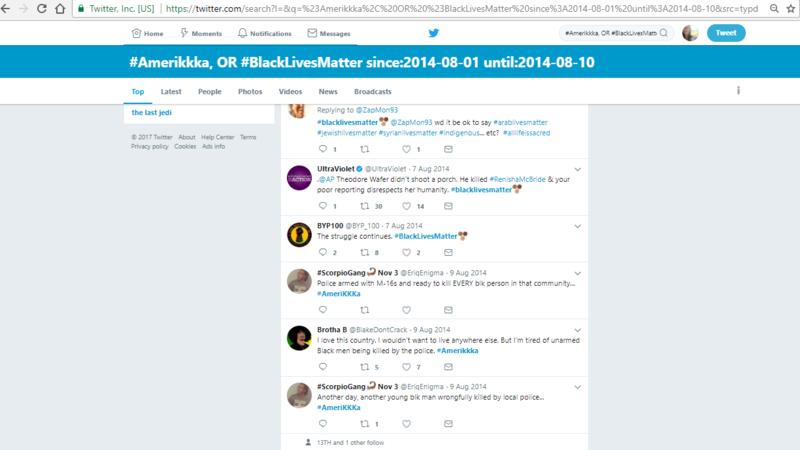 Until the 18th, my search shows that #BlackLivesMatter was used significantly less often than #Amerikkka: less than five times in a two week time frame. Garner’s last words, “I can’t breathe,” also became a hashtag. These three words are featured on t-shirts, in songs, and now book titles. 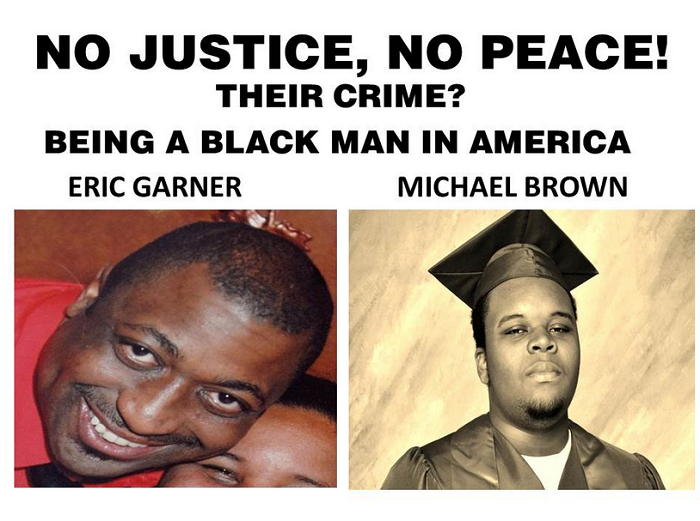 Michael Brown’s associated hashtag is #Ferguson. Between August 6th and 7th, #BlackLivesMatter began being used more commonly than #Amerikkka. In the 3rd screenshot, however, notice that there is a mix between the two. Generally, #Amerikkka critiques racism more specifically and is often accompanied by other vulgar diction connected to less-specific societal concerns. In contrast, #BlackLivesMatter–while still relevant to racism–focuses more on human-centered responses to remember the deceased. Finally, although I focused on small portions of the hashtags’ conversations, even these smaller pieces are ‘living’ because, as mentioned earlier, tweets are not permanent and change based on users’ preferences. They also have the ability to be Retweeted or Favorited, which reproduces the tweets in new spaces. This reproduction and ease of access reiterate the flexibility of a hashtag’s archive. 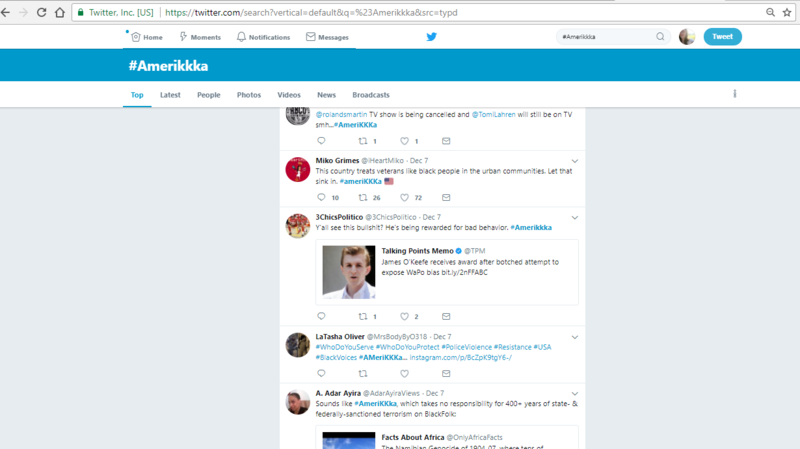 By reproducing this data here, I have not violated any ethical guidelines because the tweets that I am able to access are not from private accounts. Thus, their words are already available to the public, which means posting them here on a low-trafficked blog should not negatively impact the people whose tweets are featured here. *In the future, I want to provide more quantitive data about usage, retweets, and favorites. I attempted to work with R studio and TwitteR to accomplish this endeavor; however, there are date restrictions pertaining to how long ago the tweets were posted and R’s relationship with the social media platform. In this final blessay, I am including this excerpt from Claudia Rankine’s poetry collection Citizen An American Lyric, which was published in 2014—the same year as #BLM began—by Graywolf Press in Minnesota. 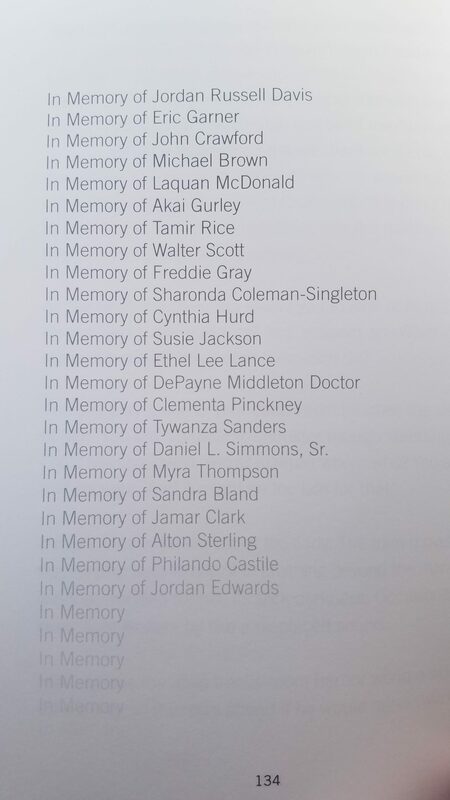 The page following this list states “because white men can’t / police their imagination / black people are dying” (Rankine 135). Disclaimer: while I hope that including this page does not violate any copyright laws, I intend to remove the image post-completion of this DH course. Notably, however, my inclusion of this page exemplifies digitization without explicit permission. 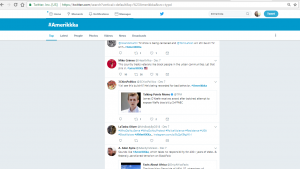 The ethical considerations of posting this page differ from if this list were simply a note doodled by someone who had no intention of it being mass-released to the public. If I stumbled upon the latter, my own intentions and the impact of my actions toward that individual would be called into question. Here, though, my post reproduced a work that has already been circulated in mass quantities, so the issue stems from publication rules rather than violation of personal rights. Whether you, the reader, have access to the excerpt or not, Rankine’s 2014 text addresses racism and inequality in the United States and is therefore a part of the same conversations as #Amerikkka and #BlackLivesMatter. Through various creative approaches, she conveys how this specific place has negatively affected an entire race. 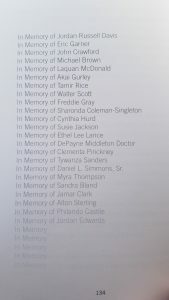 This chosen excerpt from her text displays a list of people who were killed because of racially related circumstances; therefore, she presents her own archive for the selected deceased. By slowly fading the list of names, she implies that further people inevitably will be added to those already listed. Thus, her list cannot be treated as static; though seemingly a contradictory statement, Rankine’s list provides an implied living archive for those who lost their lives to injustice because of its open-ended nature and assumption of incompleteness. Despite the conversations occurring in our current society—namely, #BlackLivesMatter—injustice still happens, and these conversations—the physical, the digitized, and the born-digital—are far from over. *Although I allude to this idea but do not completely address it in this project, I am interested in looking further into political rhetoric—seen on social media— and its effect on society. One article that acknowledges the beginnings of social media activism via Kony 2012 can be found here. Benjamin, Walter. “The Work of Art in the Age of Mechanical Reproduction.” Marxists Internet Archive, UCLA School of Theater, Film and Television, 2005, www.marxists.org/reference/subject/philosophy/works/ge/benjamin.htm. Cohen, Dan. “The Blessay.” Dancohen.org, 2012, http://www.dancohen.org/2012/05/24/the-blessay/. Accessed 28 November 2017. Fouché, Rayvon. “Say it Loud, I’m Black and I’m Proud: African Americans, American Artifactual Culture, and Black Vernacular Technological Creativity.” American Quarterly, vol. 58 no. 3, 2006. Project Muse, muse.jhu.edu/article/203948. Powell, Malea. “Dreaming Charles Eastman: Cultural Memory, Autobiography, and Geography in Indigenous Rhetorical Histories.” Beyond the Archives: Research as a Lived Process, 2008, pp. 115-127. Rankine, Claudia. Citizen An American Lyric, Graywolf Press, 2014. Terras, Melissa and Julianne Nyhan. “Father Busa’s Female Punch Card Operatives.” DH Debates, 2016, dhdebates.gc.cuny.edu/debates/text/57. Accessed 15 December 2017. “2014 Word of the Year is ‘#blacklivesmatter. '” AmericanDialect.org, 2015, www.americandialect.org/2014-word-of-the-year-is-blacklivesmatter. Accessed 1 December 2017. Underwood, Ted. “On different uses of structuralism; or, histories of diction don’t have to tell us anything about ‘culture’ to be useful.” tedunderwood.com, tedunderwood.com/2010/12/28/no-google-hasnt-proven-structuralism-but-they-may-have-made-it-useful/. Accessed 10 December 2017. 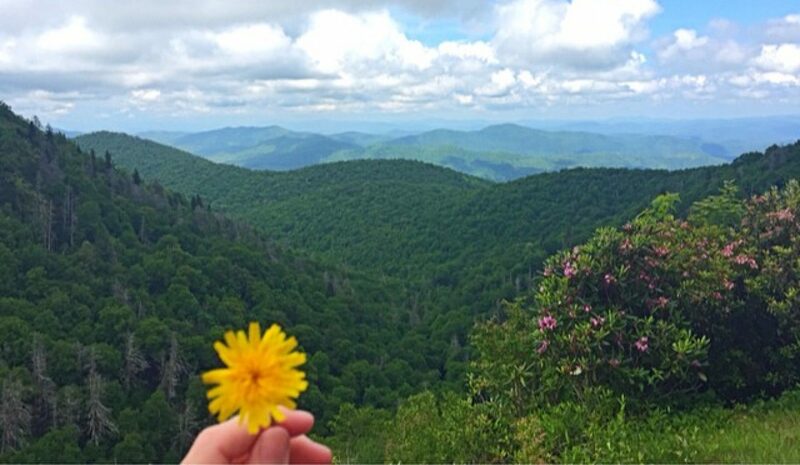 In this activity, I used the digital skills we learned in class to upload photos from a Study Abroad trip to Ireland. I found uploading the collections to be a fairly simple task; however, my Neatline experience definitely needs improvement. This practice gave me the foundational knowledge, though, that will help me create a cleaner, more streamlined site in the future. It is in the beginning stages of development, but I hope to display various, happy images of animals I have encountered. 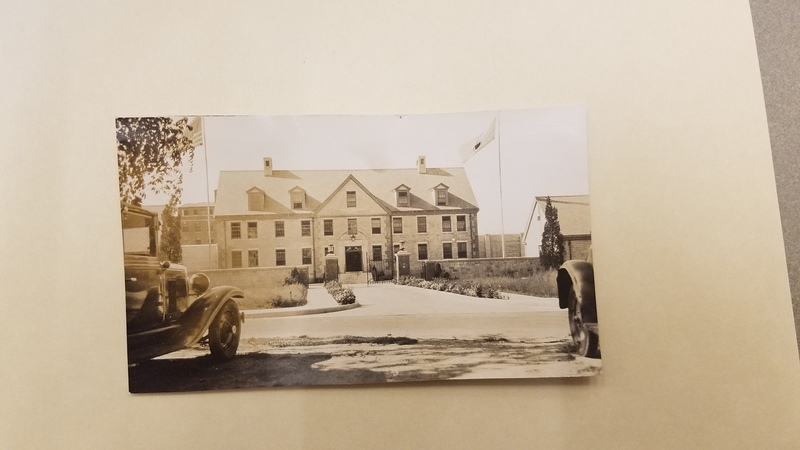 Prior to interacting with SCUA’s physical collection, I expected to find information about the educational programs that Gill implemented at the Norfolk Prison Colony. 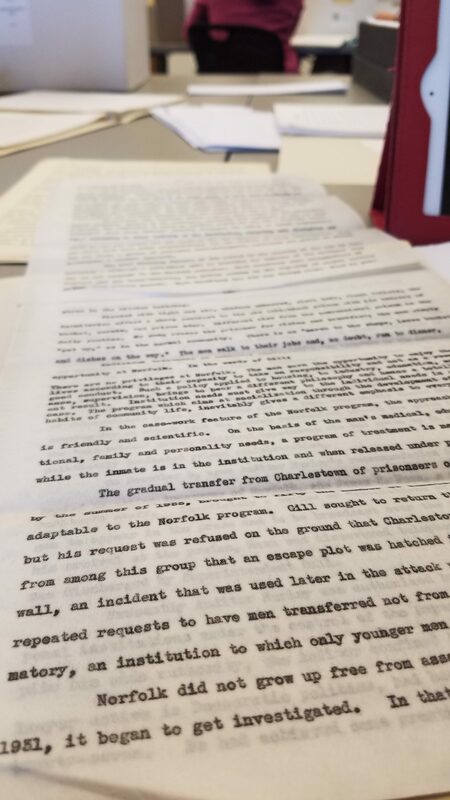 However, the collection mostly encompasses a manuscript, which details a generalized explanation of what occurred at Norfolk and predominately focuses on the relationship between politics and the prison’s eventual regression. Here, by regression, I mean transitioning toward more typical, restrictive penal facilitation. 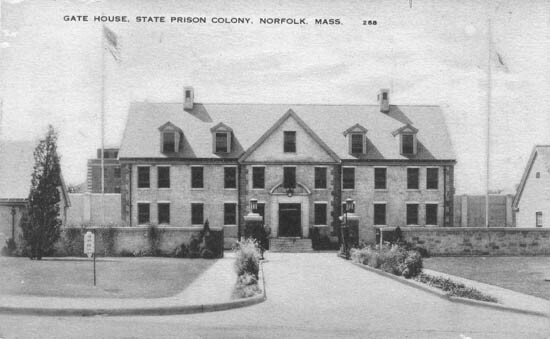 Notably, the prison ran successfully at first with its additional programs such as Inmate Councils and a Debate Society, but with the introduction of more men—of whom Gill decided were not fit for Norfolk’s more ‘loosely’ regulated prison—Norfolk’s benefits were quickly reexamined by both the media and leading government officials. Francis A. Hurley, an auditor, is said to have focused his investigation on missing money in the inmates’ accounts fund in an effort to use this information for later personal political gain. This focus eventually caused Gill to lose his position as superintendent and the prison to take a more traditional turn. From the various letters between O’Connor, Kellogg, and Parsons, I noticed threads of mediation in their communication. The collection consists mostly of letters between O’Connor and Kellogg, the editor of The Survey magazine. In order to learn more about this magazine and the context of publishing O’Connor’s manuscript, I obtained a copy of Clark A Chambers’s book Paul U. Kellogg and The Survey: Voices for Social Welfare and Social Justice. Currently, my inquiries are as follows: why do pieces of O’Connor’s work present information that could be ‘too’ detailed for publication; what are the relationships between the various men’s affiliations and politics; why must the men withhold certain information in different interactions; what is The Survey’s interest in prison? Norfolk Prison Colony Collection (MS 074). Special Collections and University Archives, UMass Amherst Libraries. This collection consists of ten folders that include photographs and various writings such as notes, letters, and manuscript drafts. Related collections about Howard B. Gill, the architect, can be found at Boston College. The Norfolk Prison Colony became the Massachusetts Correctional Institution –Norfolk, which is a medium security prison and the largest in the state. A quick web search retrieves the following website: http://statesofincarceration.org/states/massachusetts-norfolk-prison-colony-debating-society. Here, researchers focused on the rehabilitation techniques used within the facility. Their work within the prison emphasizes the inner-workings of the Norfolk Prison Colony Debating Society. Notably, Malcolm X participated in debates and claims this experience as his “baptism into public speaking.” Despite receiving criticism for their progressive goals, the prison maintained “a reputation for inmate educational programs with ties to area colleges like Harvard, Emerson, and Boston University. “ So, rehabilitation was, in fact, strongly connected to education. Like College Guild’s motto today–“Respect Reduces Recidivism”–Gill thought that providing a life more aligned with ‘normal’ society would best help the prisoners in reacclimating post-incarceration. The Boston Globe interviewed Joel Winslow–the son of prison superintendent Maurice Winslow–which can be found here: https://www.bostonglobe.com/metro/regionals/west/2013/01/13/secrets-norfolk-talksecrets-norfolk-secrets-barsnorfolk-prison-warden-recalls-unorthodox-childhood-norfolk-prison-secrets-behind-talksecrets-norfolk-secrets-prison-behind/Th1V3ZsB3LgMrIP2iPlC4H/story.html. In the interview, he mentions the debate team along with the prison farm, baseball team, and boxing matches. 1. By investigating the plans for their “model community prison,” can we see any of these intended goals working in prisons today? 2. How did the political atmosphere at the time affect the prison’s creation? 3. Are the sociological goals different from the rehabilitation processes seen today? 4. When did rehabilitation rather than retribution and punishment become part of the penal system’s concerns? 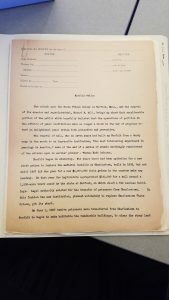 My goal for researching this archive is to learn more about what it meant to be an ‘ideal’ prison in the 1920s and 1930s in order to compare the progressive programs of that time period to the resources that are available to prisoners in our current society. Specifically, I am interested in whether the Norfolk Prison Colony sought to establish educational programs as a part of their rehabilitation process, particularly writing-based courses. If so, how do they function similarly and/or differently from modern non-profit programs like College Guild? This site is created for ENGL 891 DS and encompasses work from throughout the Fall ’17 semester. As an MA/PhD student in Composition and Rhetoric at the University of Massachusetts Amherst, my interests lie in WPA and prison literacies. Currently, I work predominately with the College Guild program, volunteering to read Creative Language, Journalism, and Greek Mythology units for incarcerated students. For more information, feel free to contact me: mnjones@yhc.edu.